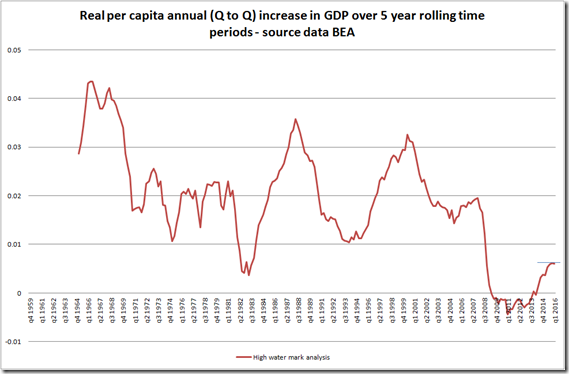 US retail sales…Is the Sun really shining again? 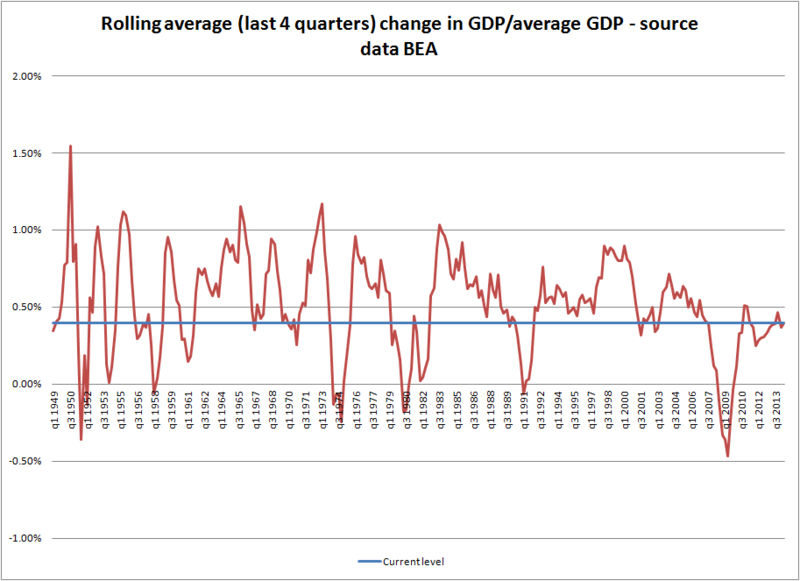 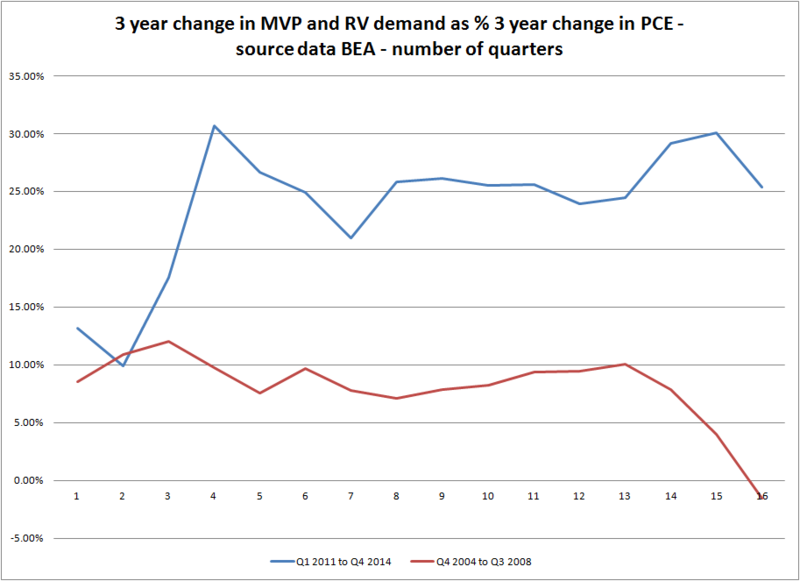 In rebound mode, but nothing as yet to suggest trend of slowing growth cycles has been broken. 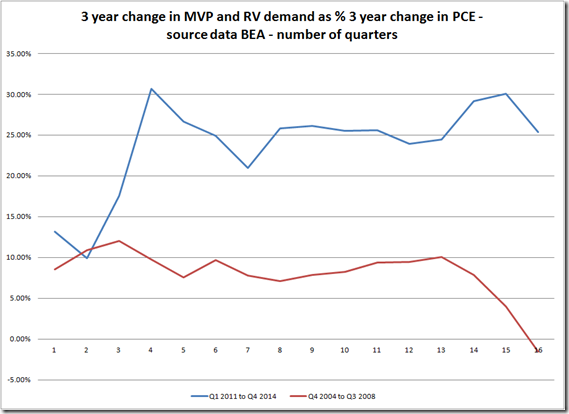 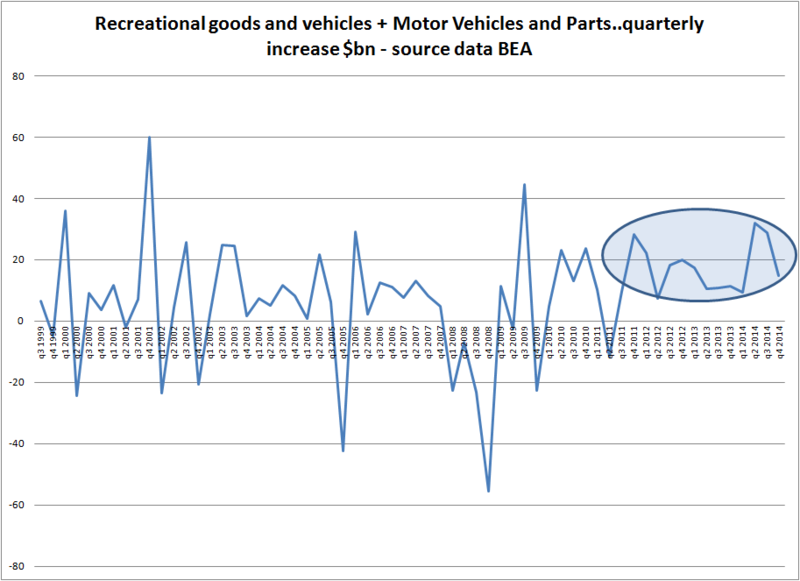 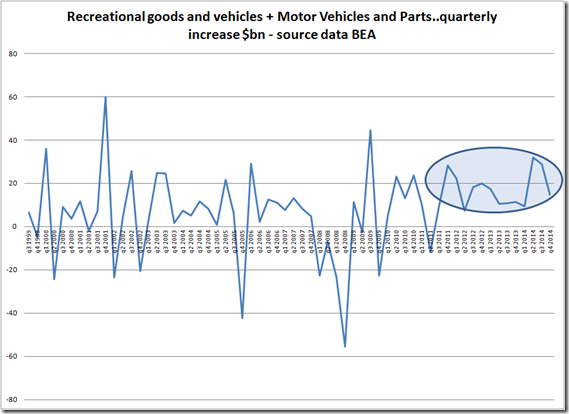 Motor Vehicle and Parts sales, a key driver of sales growth heretofore, looks to have slipped to a much lower gear: less consumer credit growth fuelling demand? 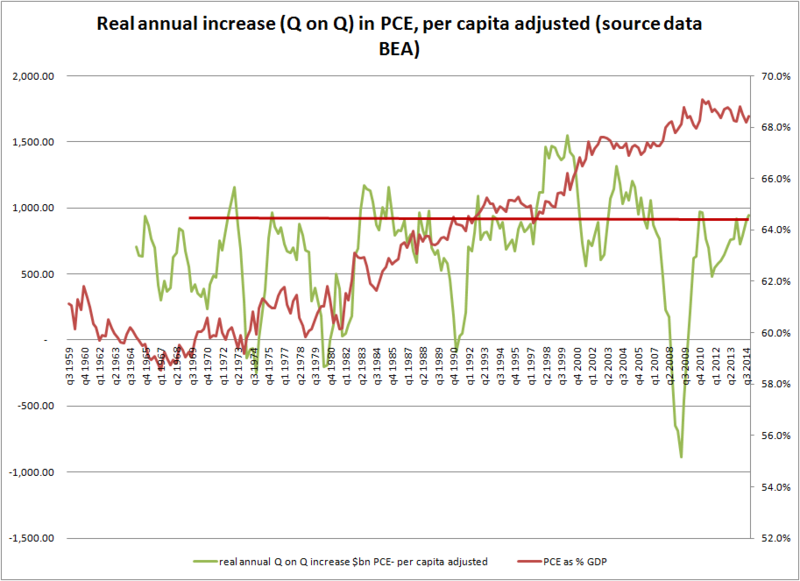 Retail sales adjusted for CPI ex shelter and adjusted for population growth only just bubbling up around pre crisis levels. 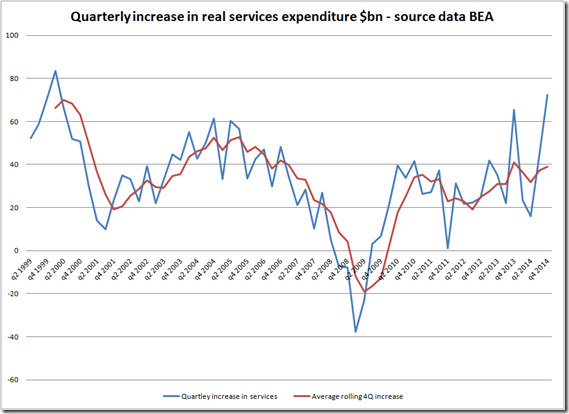 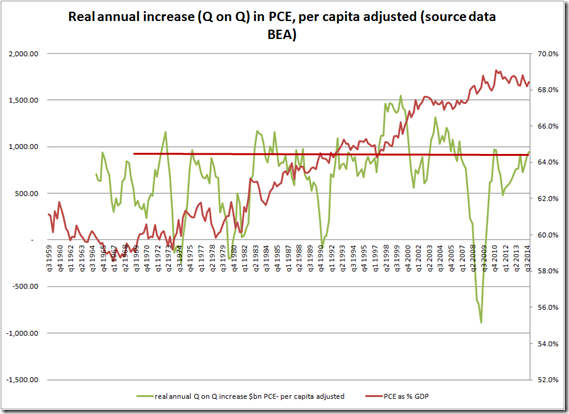 Seasonality: some questions over the extent to which seasonality is impacting the data. 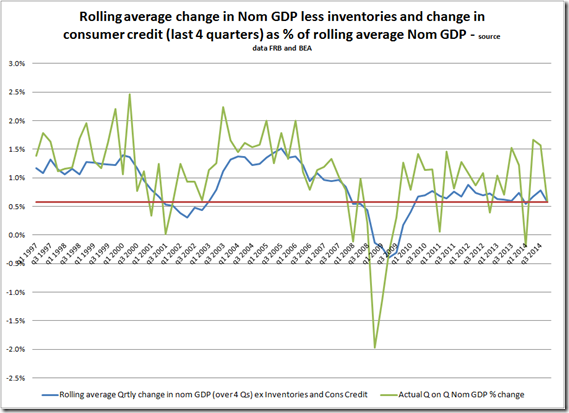 Inventory to retail sales growth at historically high levels: economy exposed to heightened short term risks to spending. 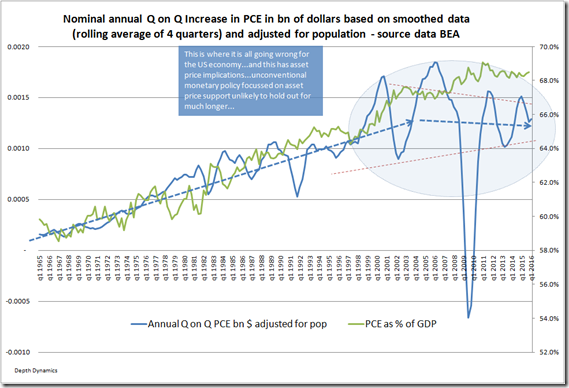 CPI ex shelter, flatlining post 2012. 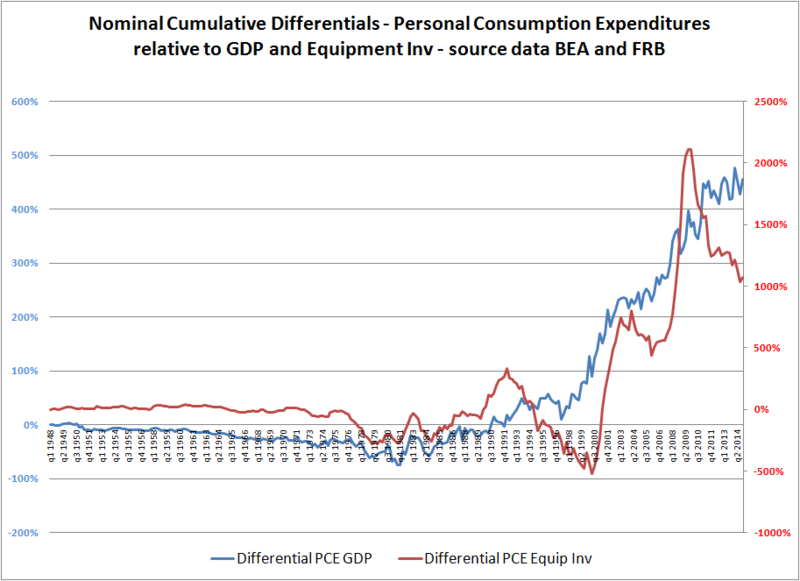 Boundaries to retail sales growth: consumer credit to disposable income ratios, long term income growth declines, peak personal consumption expenditures and continuation of weak profile post late 1990s: longer term dynamics at play. 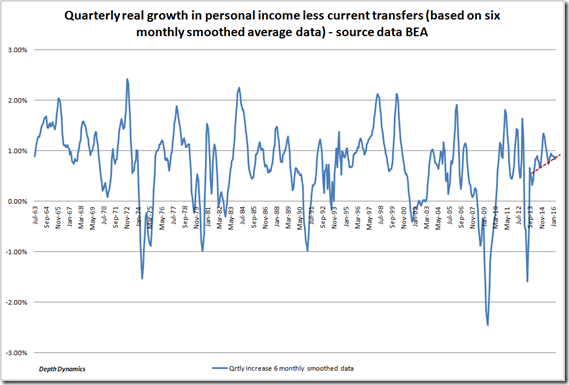 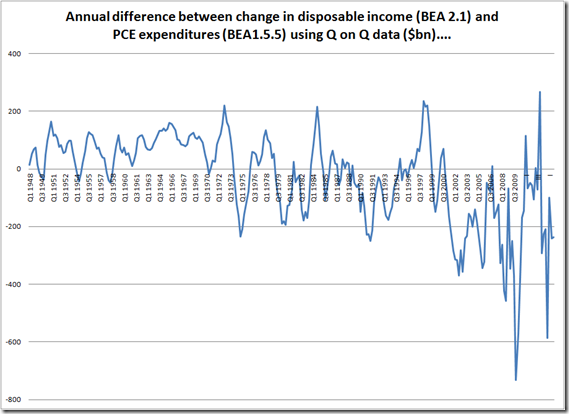 US incomes…peaked or just about to surge? 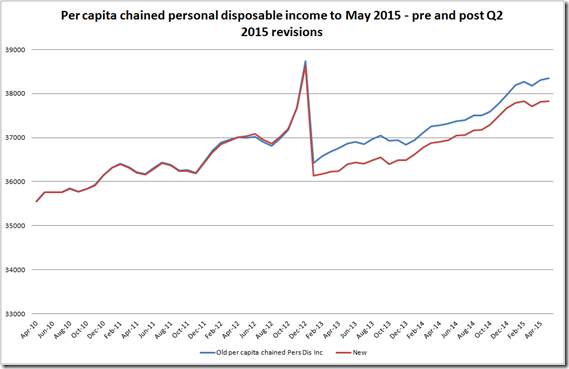 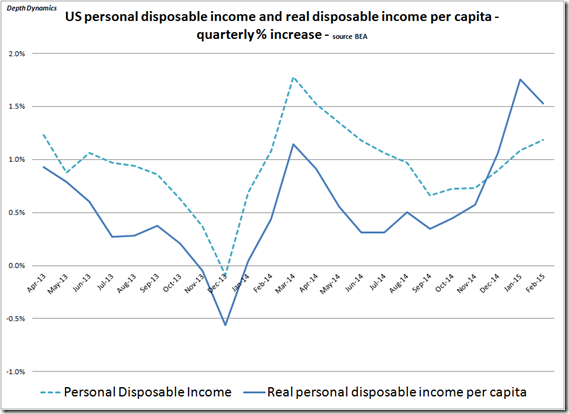 Inflationary dynamics have brought about a large relative increase in real incomes over the last six months or so. 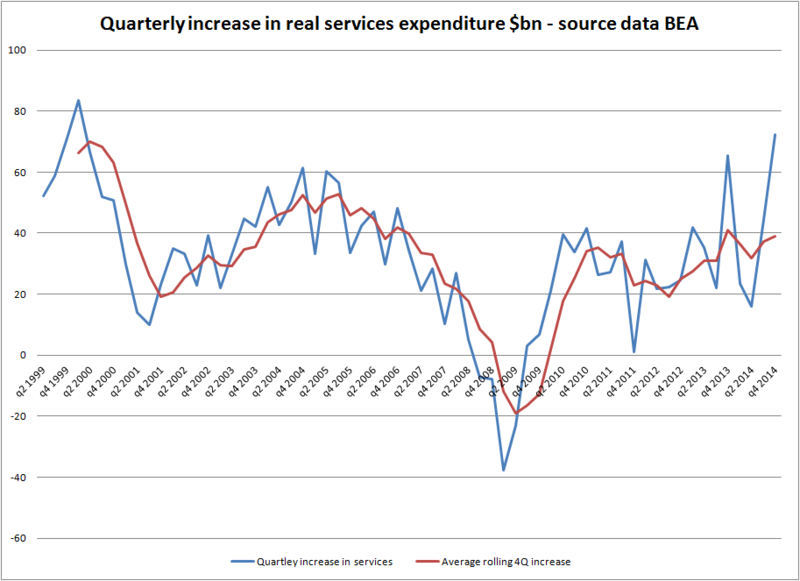 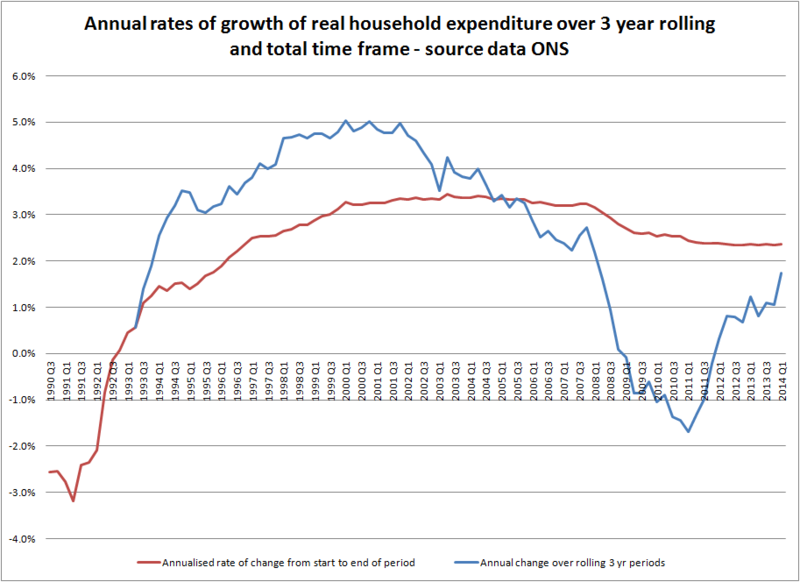 Yes it looks as if much of the most recent improvement has not been “spent”, but it is only 1 or 2 months into this gap which must itself be set against strained income increases over the last decade. 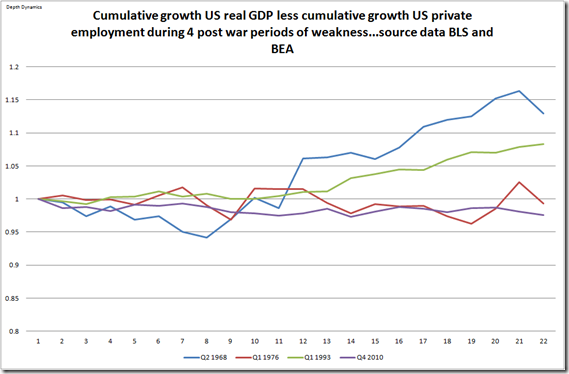 Longer trends and frames remain important for the sustained growth rates over time and the current frame remains a weak one. 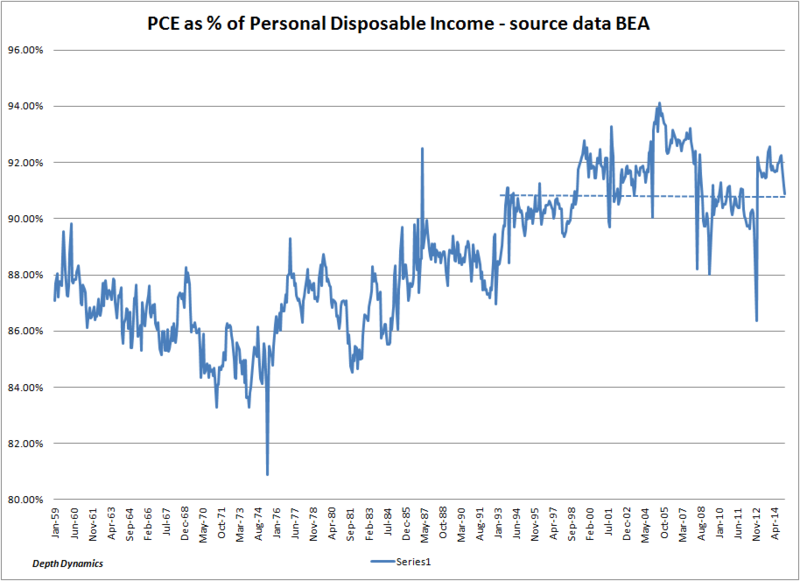 Personal consumption expenditures as a % of disposable income remain at historically high levels and consumer credit growth may also be a notably factor weighing against leeway for growth in consumption (see end of post). 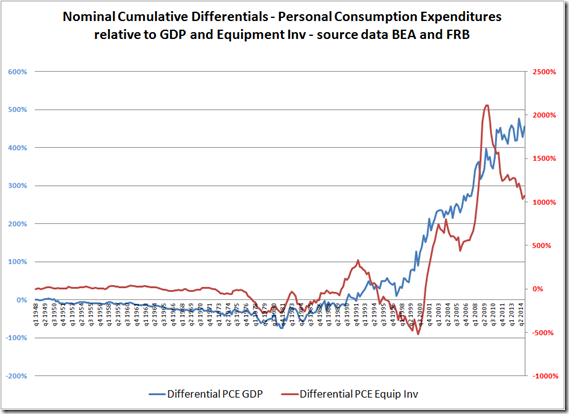 Personal consumption expenditure is the most important component of US GDP and growth in real Personal Consumption Expenditure (PCE) is tied to the productive capacity of the economy. 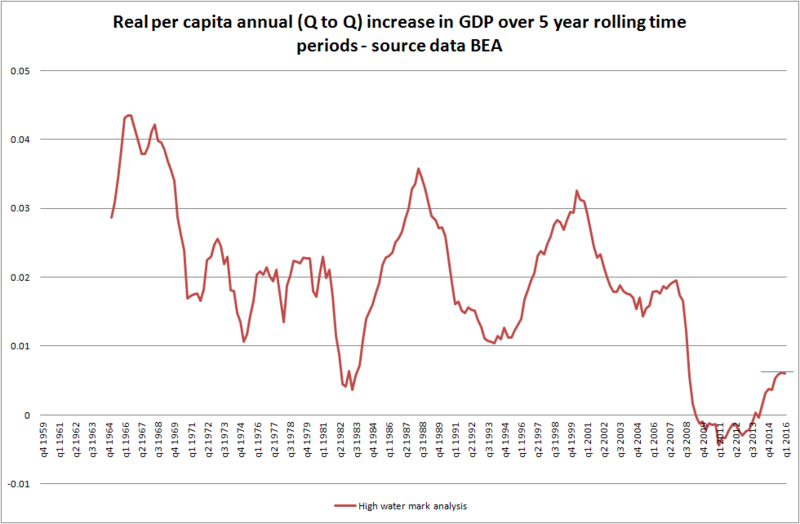 So why on a real per capita basis has the economy failed to produce sustained increases in consumption capacity post the early 1980s? 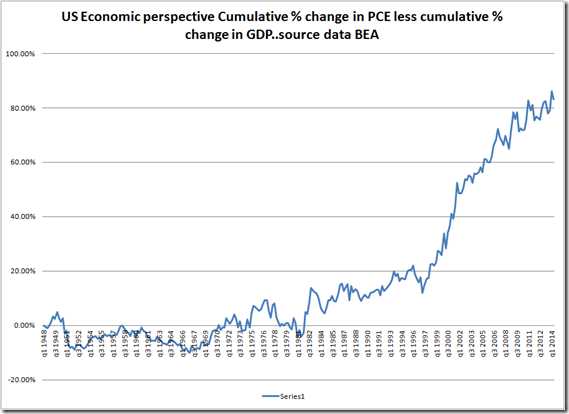 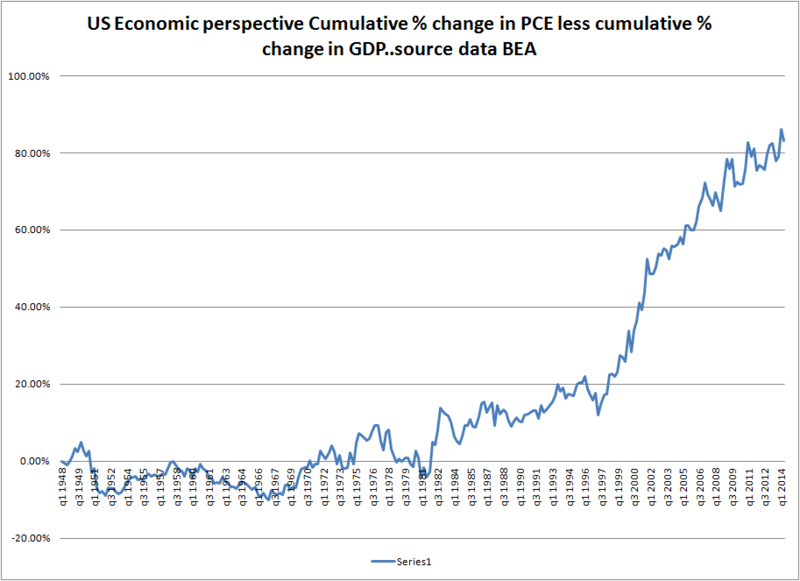 And note that this is despite an increase in PCE as a % of GDP over the post war period. 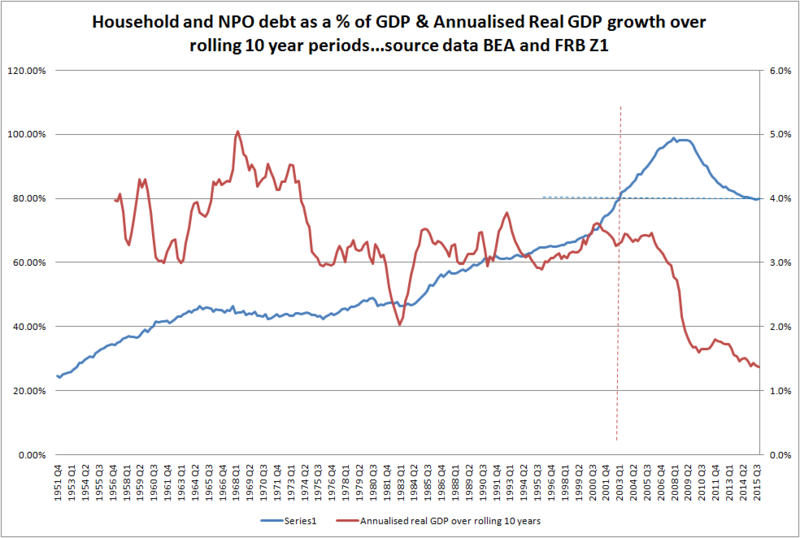 And relative to the prior debt fuelled cycle we find that expenditure on MVPs and RV combined is a much greater…I have pointed out concerns with respect to the growth in non revolving consumer credit relative to income growth, a ratio which stands at historically high levels. 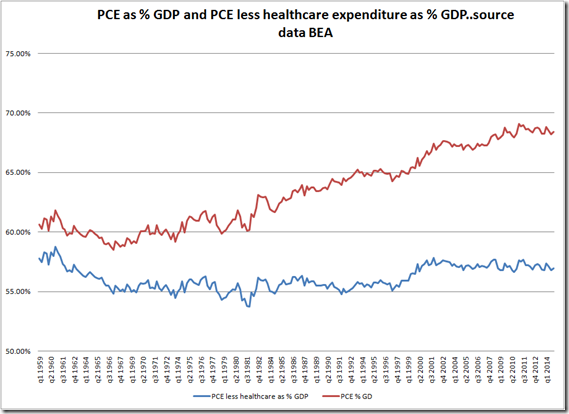 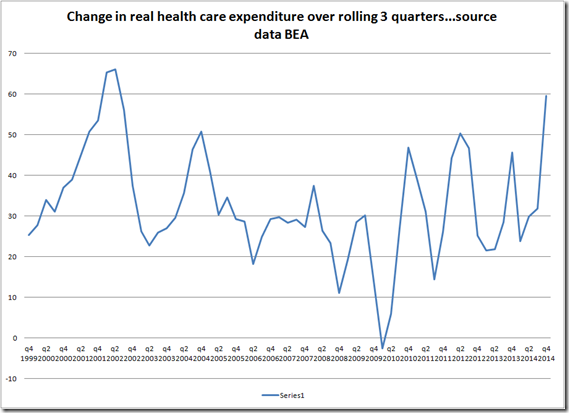 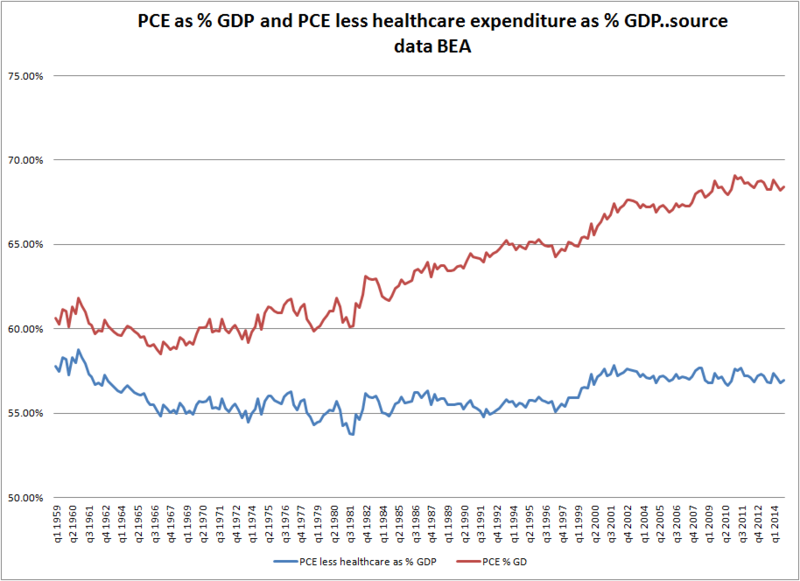 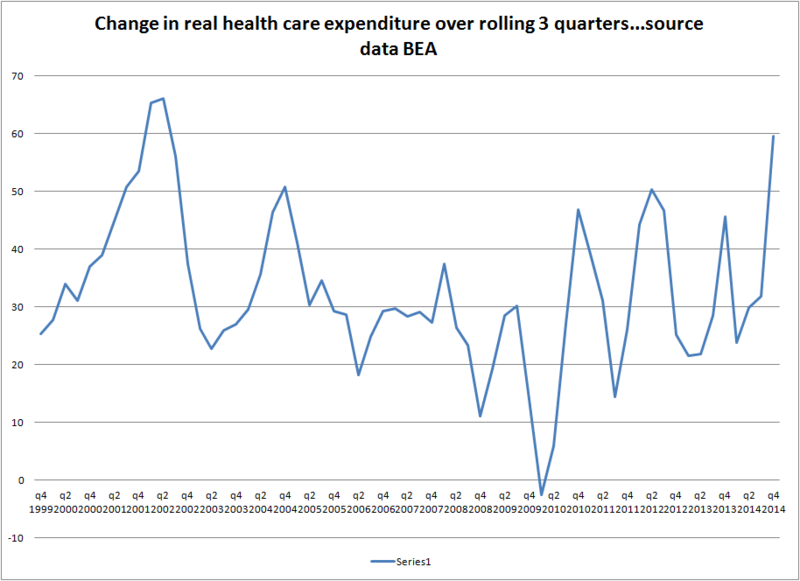 Interestingly if we take out healthcare expenditure from PCE, PCE as a % of GDP has been more more stable..
Exports have been an important driver of growth recently, but more recently has fallen back as a nominal driver of expenditure: there are many explanations for this amongst them the recent decline in the oil price and weakening global demand growth. 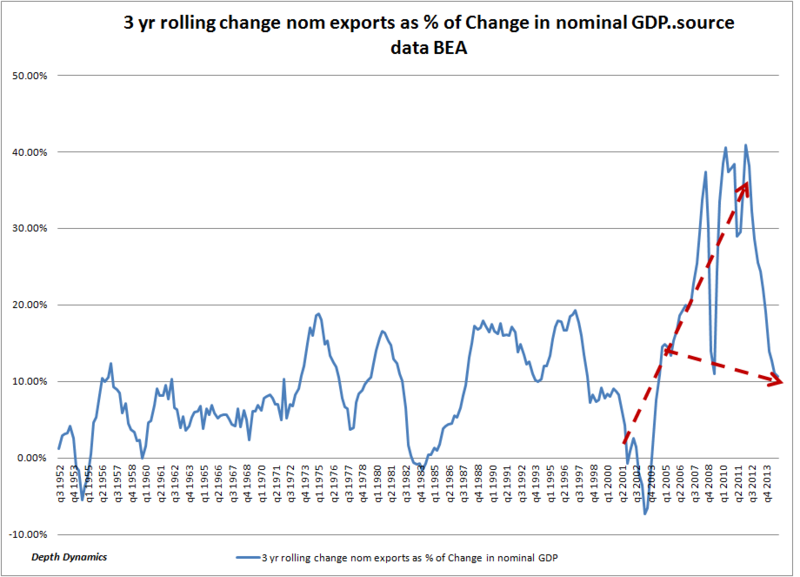 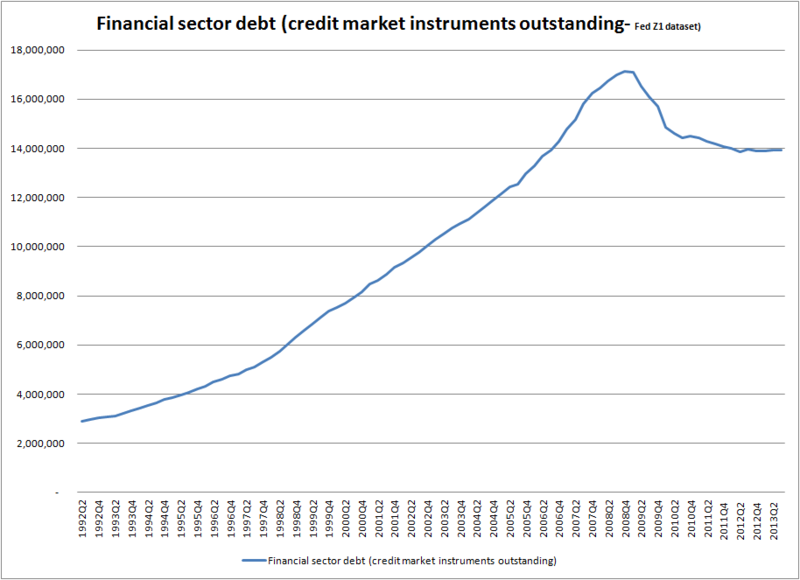 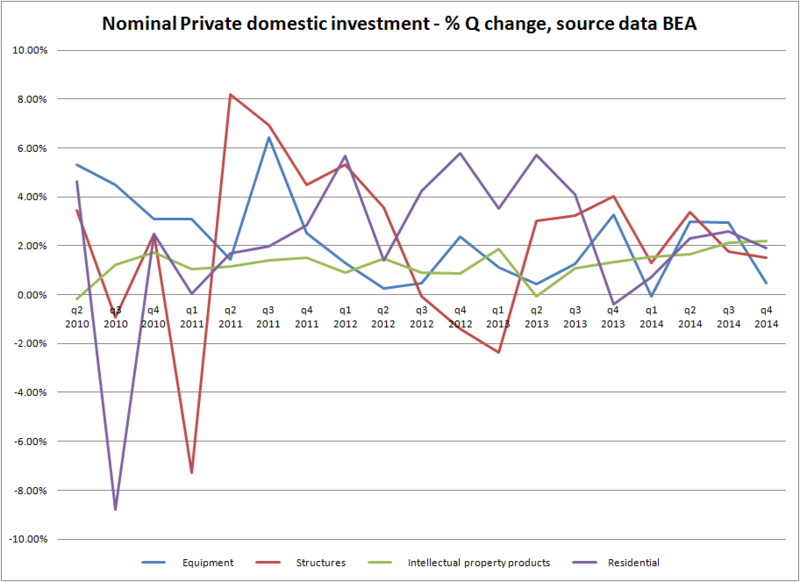 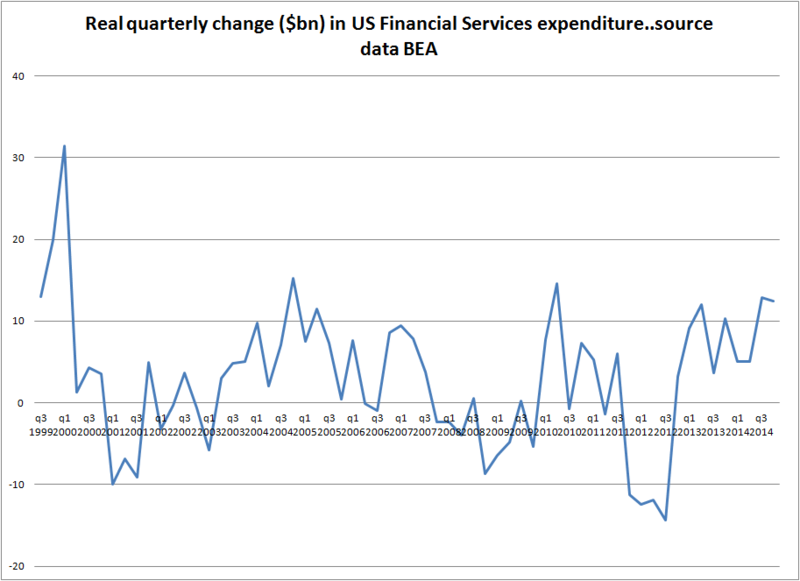 And of course the chart raises the question, where is the growth going to come from? 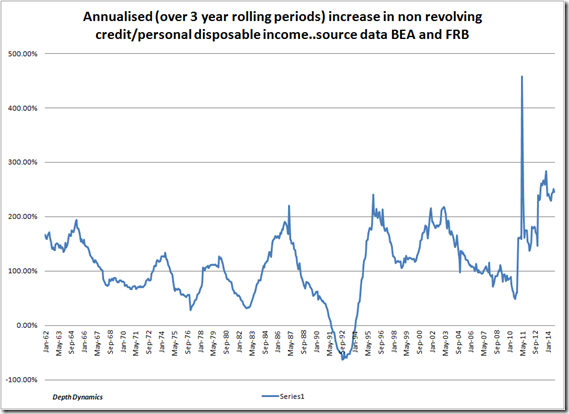 US consumer debt and income dynamics are quite constrained! 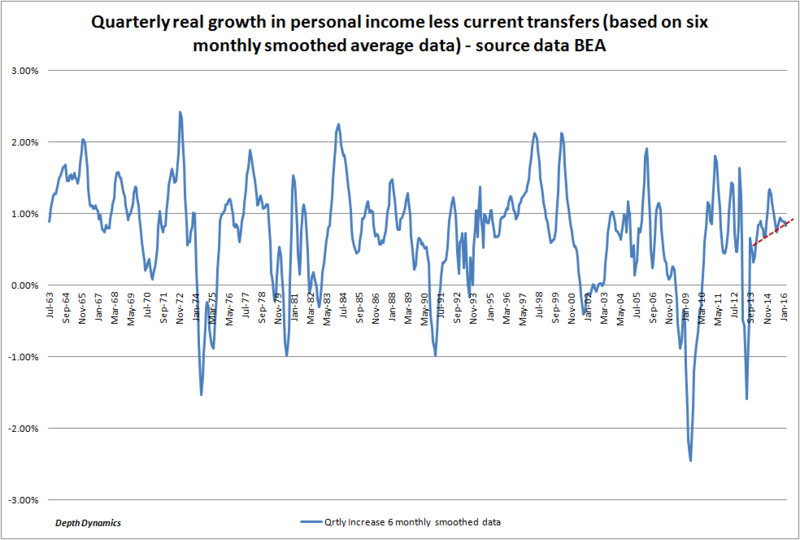 Low savings rates, high levels of consumption relative to income and a heightened dependence on current transfers for income growth looks to be a poor frame for consumption growth. 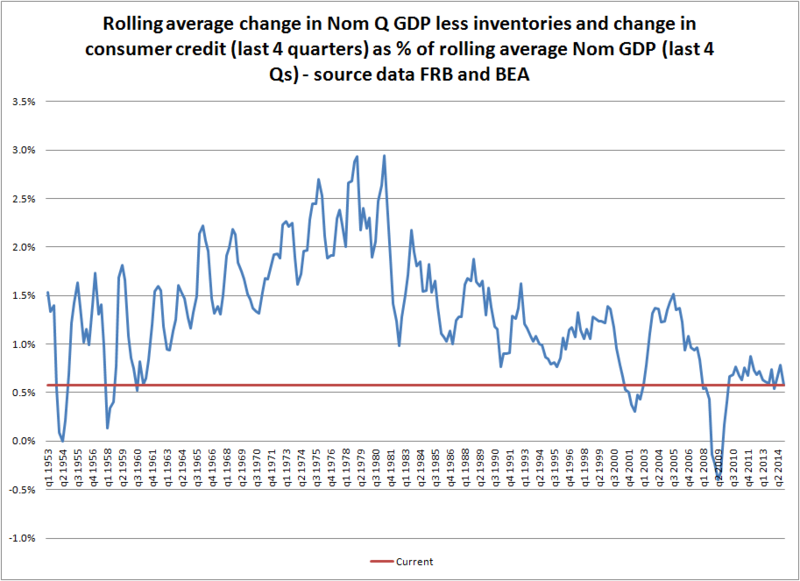 Too much reliance is being placed on “auto loans” and a steady if unspectacular growth in employment. 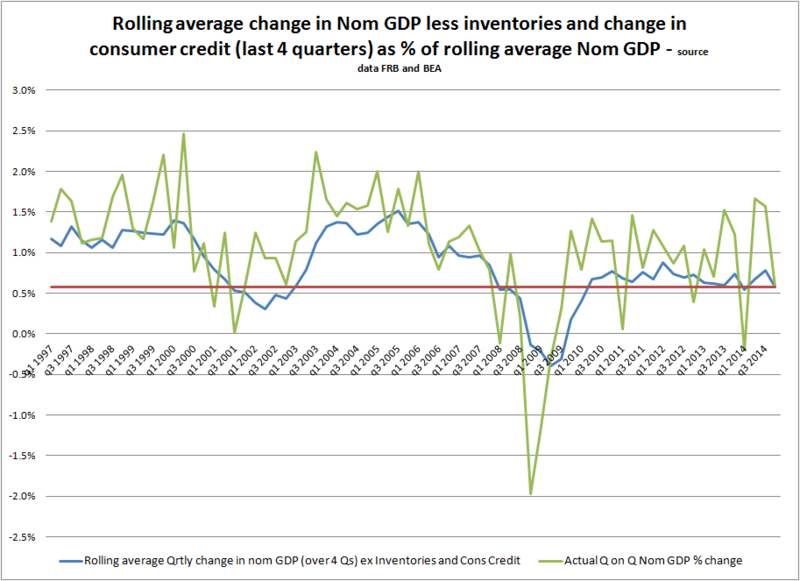 US consumer debt has been growing at a reasonable pace, and non revolving debt particularly so. 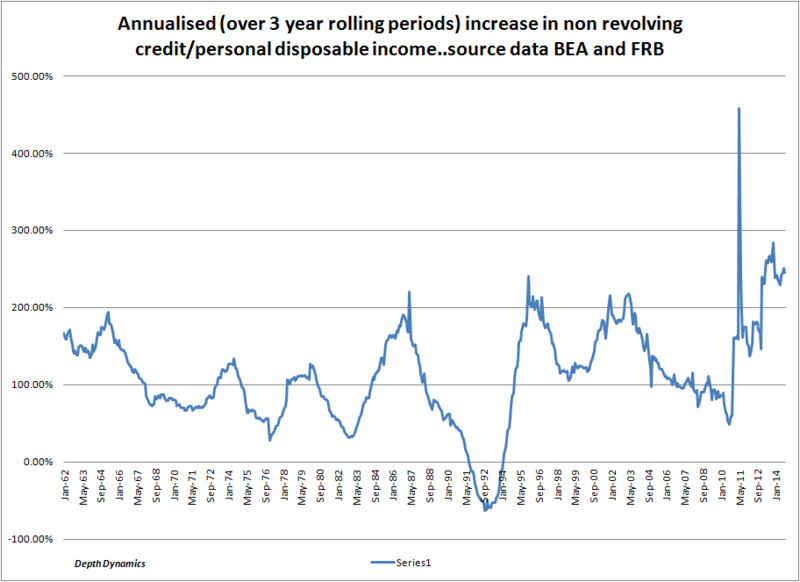 In fact if we relate annual average growth in non revolving debt to growth in personal disposable income (using 3 year rolling averages) we find that non revolving credit growth is at historically high levels relative to income growth. 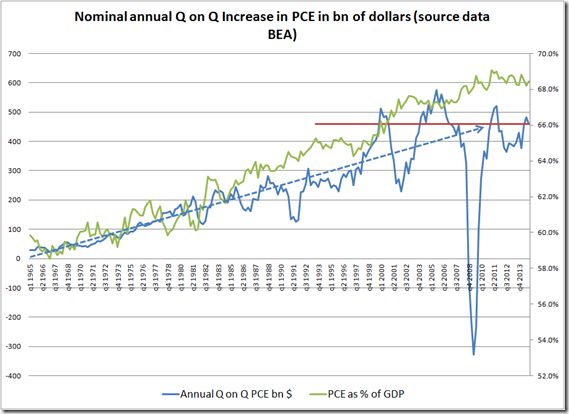 China may have a perfect deflationary frame! 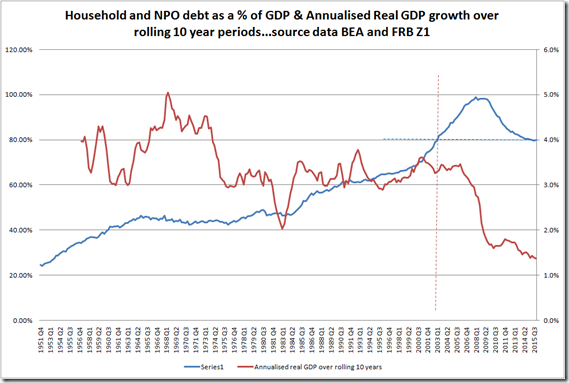 In an October 29 blog post I talked about risks posed by outsized debt financed gross fixed capital investment binges and high savings rates. 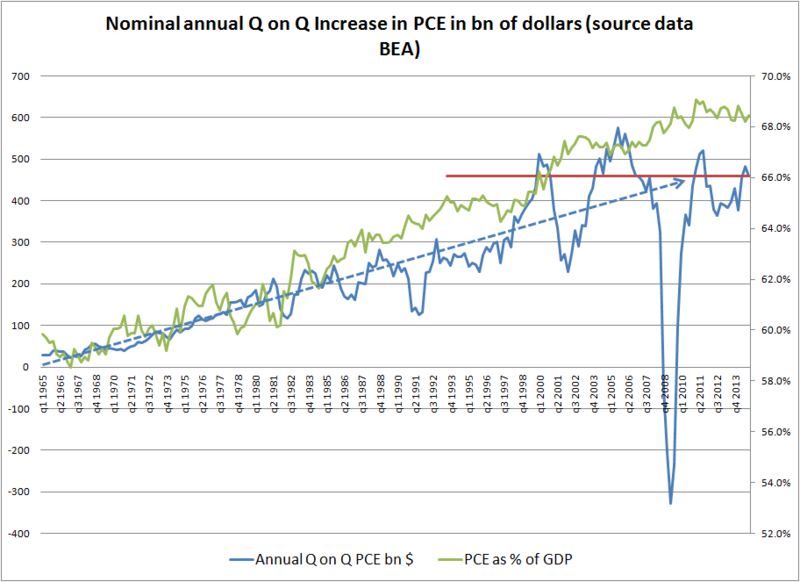 I wanted to refer to this with respect to deflationary risks in East Asian economies, per a rather good piece by Ambrose Evans Pritchard in the Telegraph. 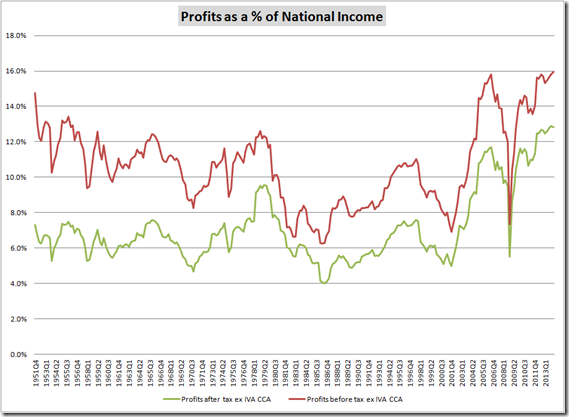 Price x quantity = output, and output more or less = national income. 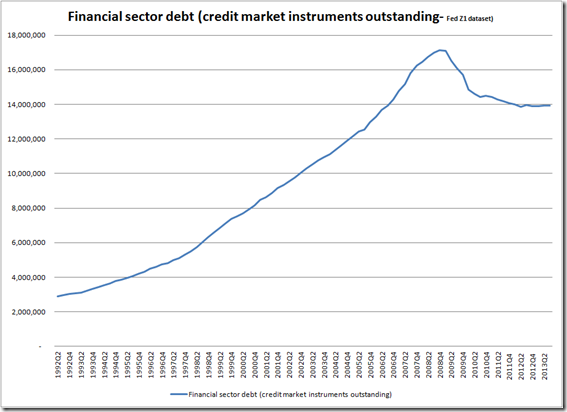 I must admit I have not read the House of Debt, but I did read Professor Sufi’s statement to the Senate Subcommittee on Banking, Housing and Urban Affairs Subcommittee on Economic Policy. 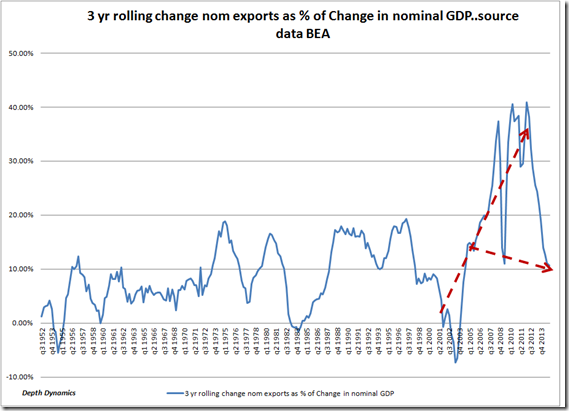 How did we get into this mess? 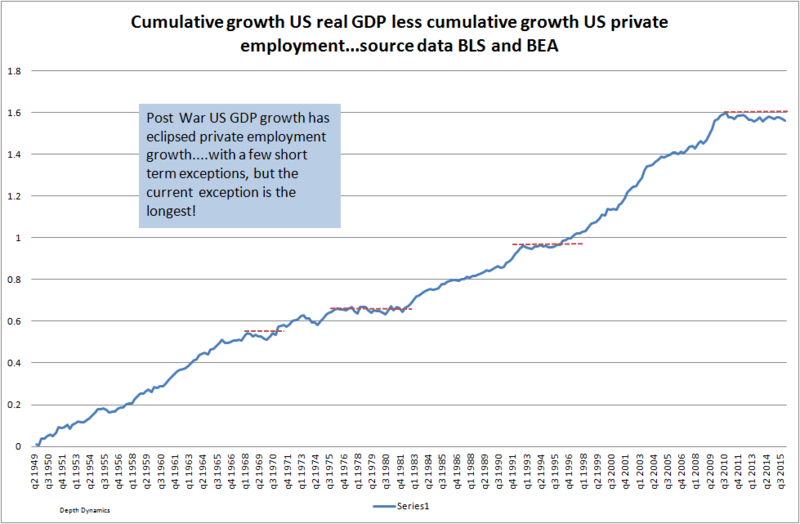 And why is it taking so long to recover? 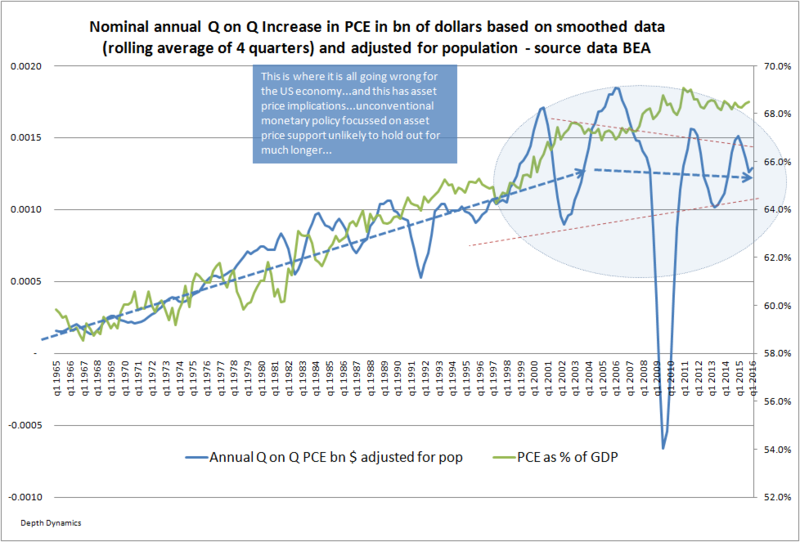 My research with Atif Mian at Princeton University suggests that the culprit is the devastation of wealth suffered by middle and lower income American households during the Great Recession. 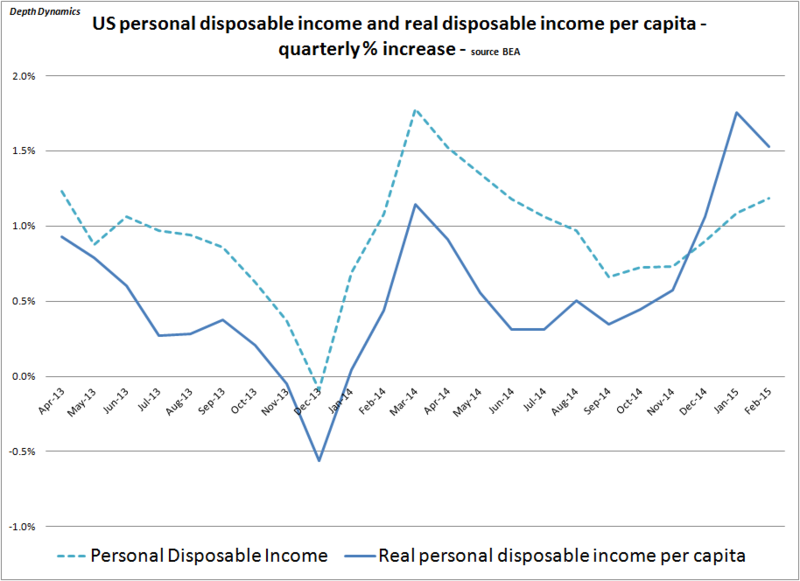 The weak recovery is due in part to the lack of any rebound in wealth among these households since the end of the recession. 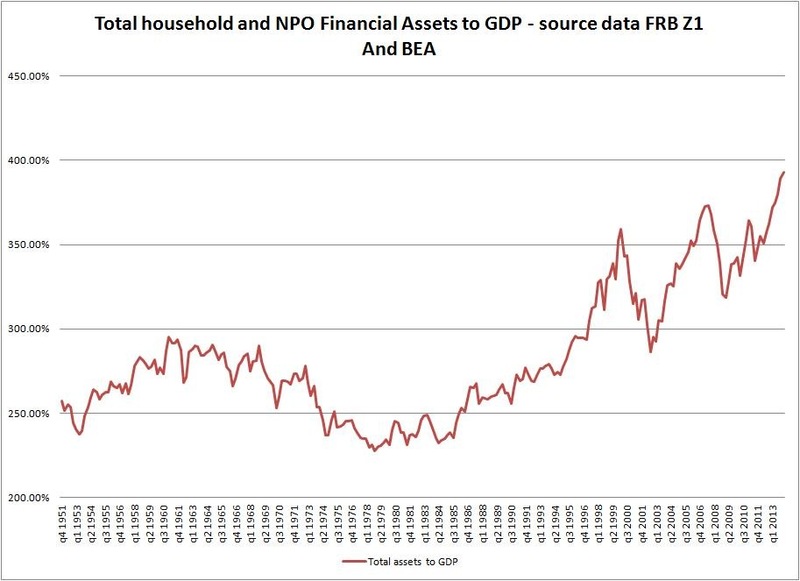 It was not the devastation of wealth per se but the accumulation of debt combined with invigorating domestic and global structural imbalances that led to the crisis. 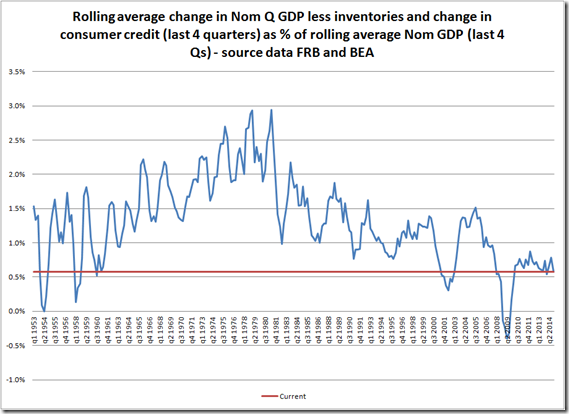 The increase in the value of homes prior to the housing collapse was a consequence of excessive asset focussed money supply growth, lax lending standards and attendant growth in consumer debt. 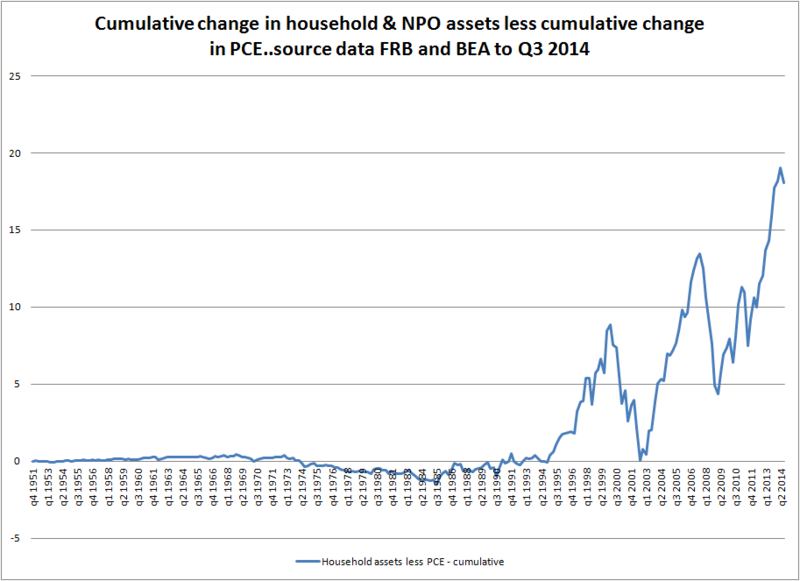 To pin the blame on asset prices incorrectly ascribes blame to the natural risk and volatility of asset prices. 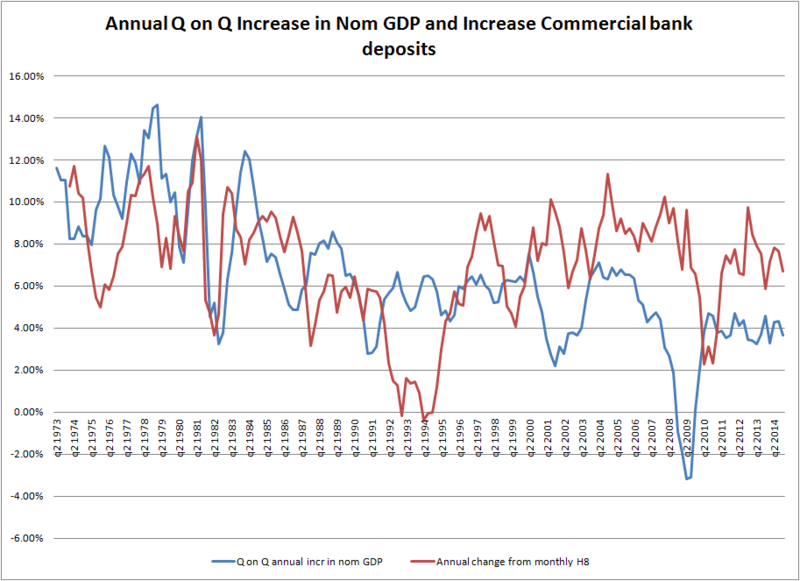 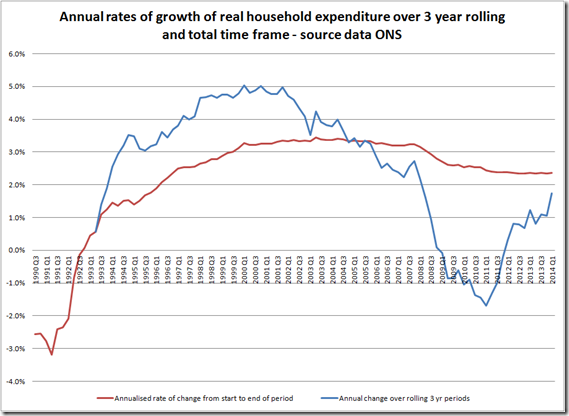 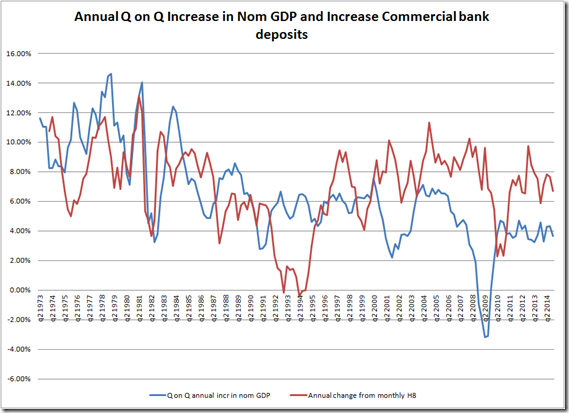 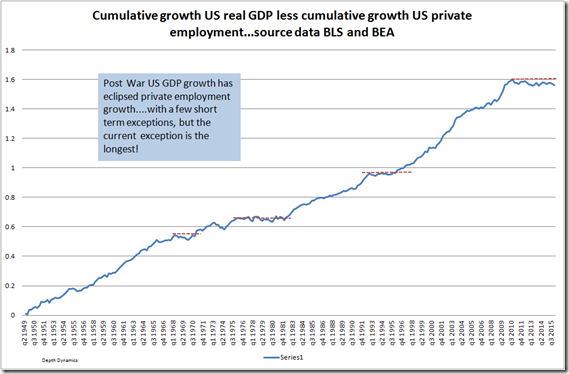 Re Neil Irwin’s Archive “You Can’t Feed a Family With G.D.P.”…but the family has been eating GDP??? 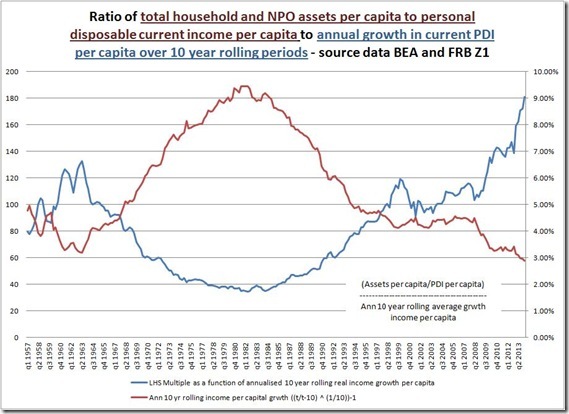 In a recent Washington Post article Neil Irwin quipped that you cannot feed a family with GDP and illustrated this comment with a graph of GDP relative to income growth. 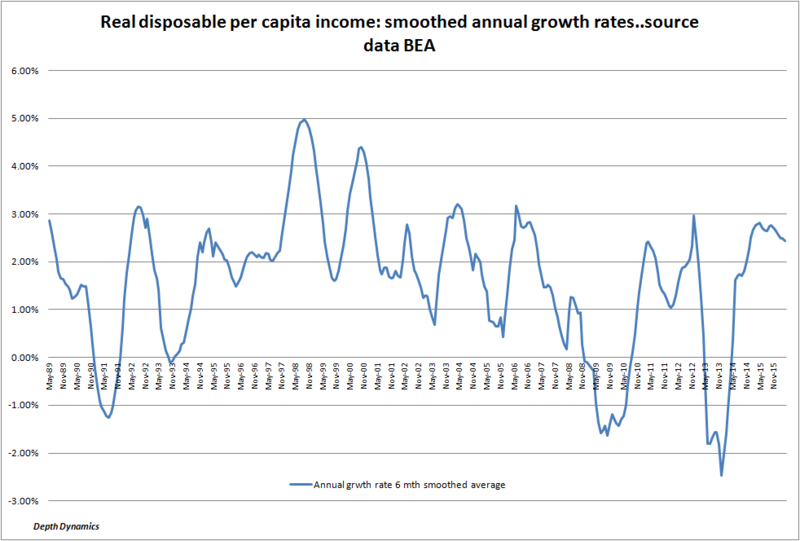 The graph showed the rate of growth of GDP and median income moving in opposite directions from circa 1998 onwards. 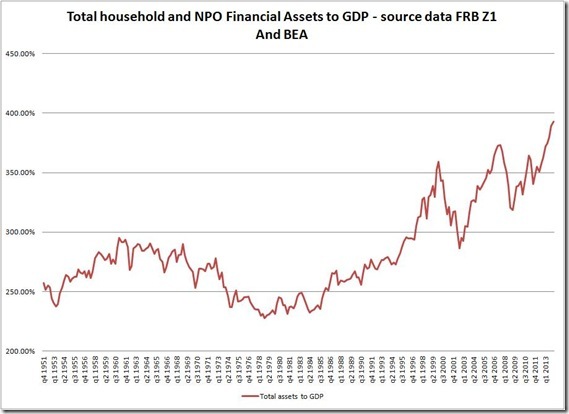 My point is that the family has been feeding its family with GDP, to a large extent, via debt and falling savings and that it was the combination of high debt levels and weak income growth that played a major role in the crisis and weak economic growth thereafter. 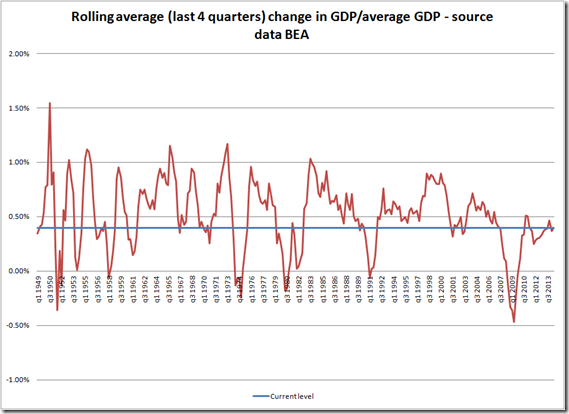 I have used the start point for the analysis as the peak of the previous economic cycle given that part of the growth in the early 1990s would have been due the rebound in consumption from this earlier recession. 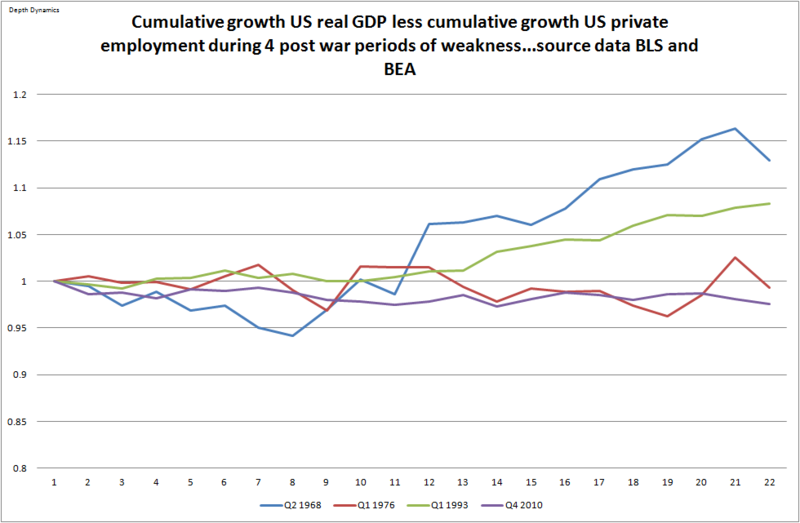 In fact, we can see that growth initially accelerated to Q4 1994, but then set off again on a second substantial leg that peaked between Q1 2000 and Q4 2001. 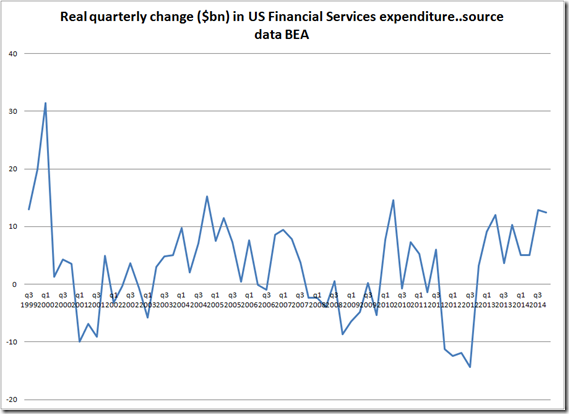 Scratching my head? 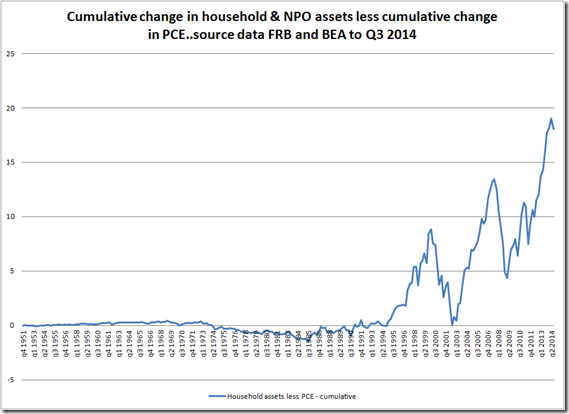 How far does this asset thing need to be pushed before mission accomplished? 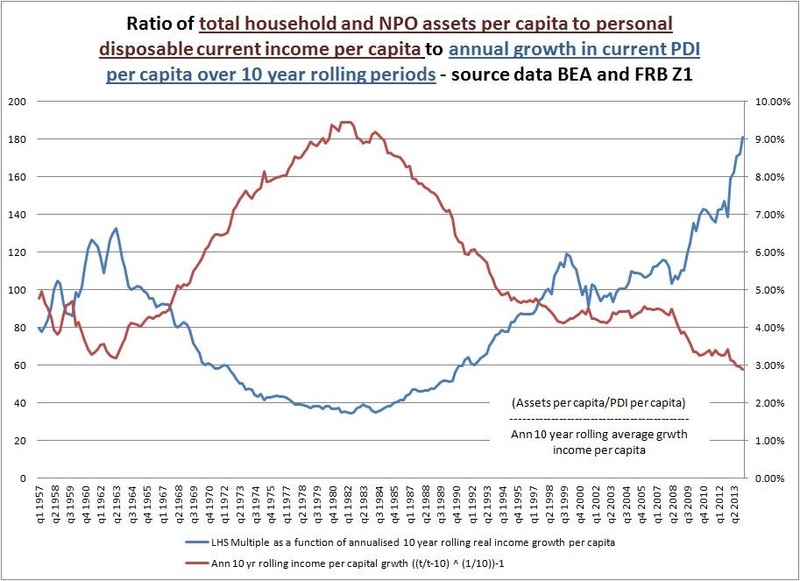 The blue line shows household and NPO asset per capita relative to annual growth in income per capita (over rolling 10 year periods). 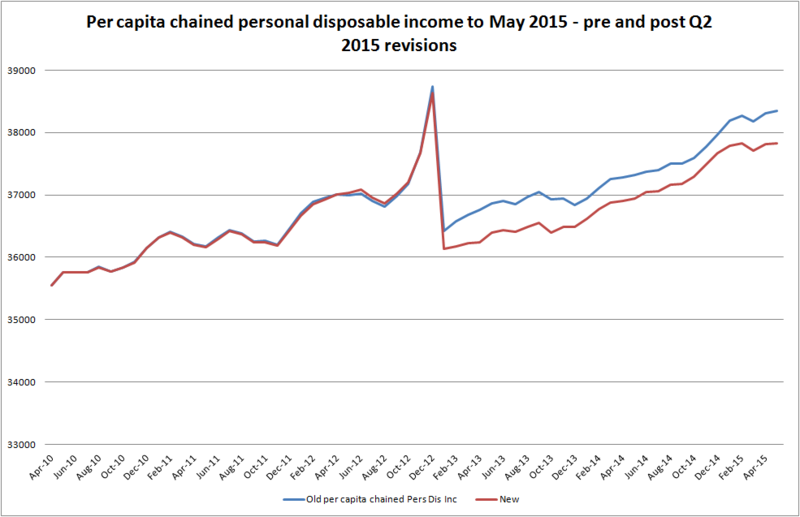 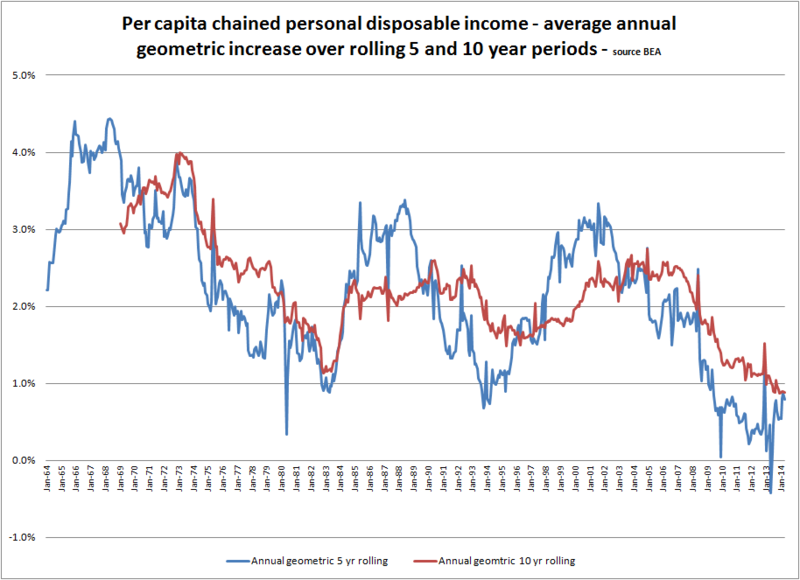 The red line shows the annualised increase in disposable personal income per capita over 10 year rolling periods. 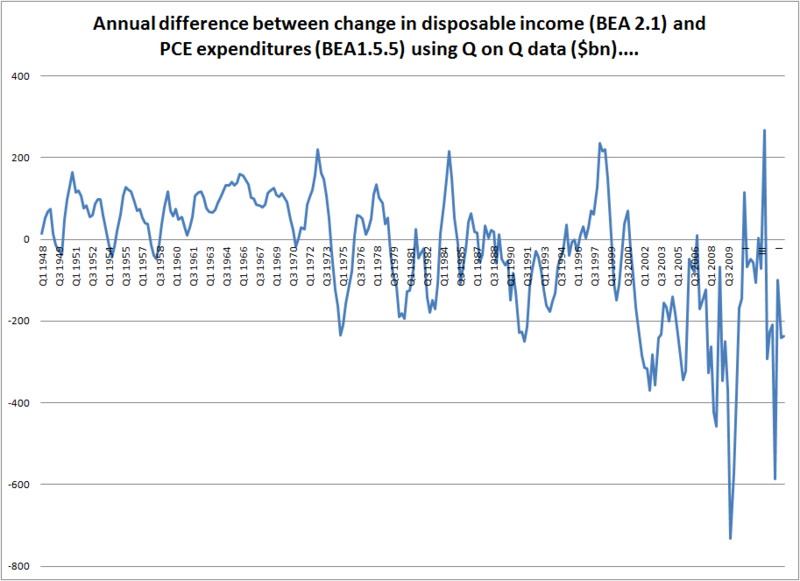 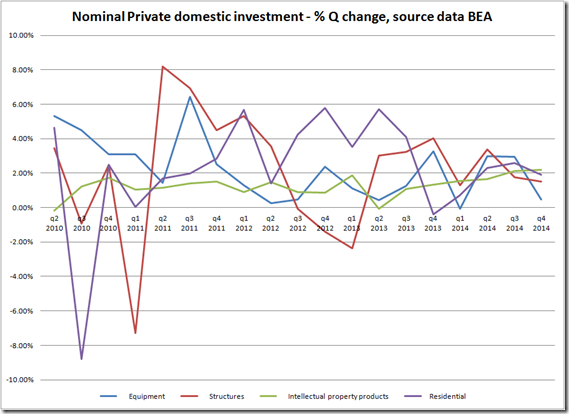 Now clearly assets are growing relative to income at a time when income growth is declining. 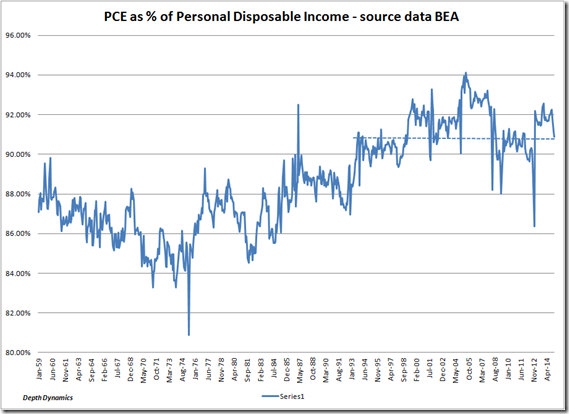 QE is filling the income growth gap. 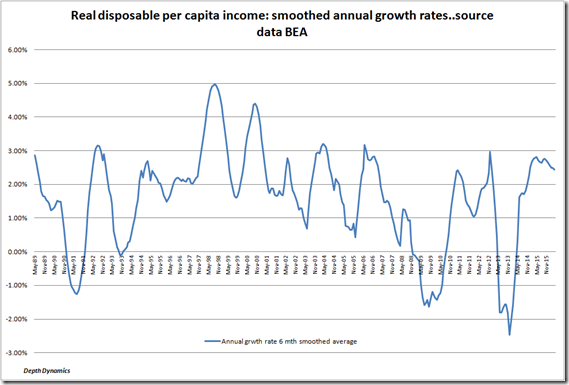 When have we ever had a bull market with such weak income growth…? 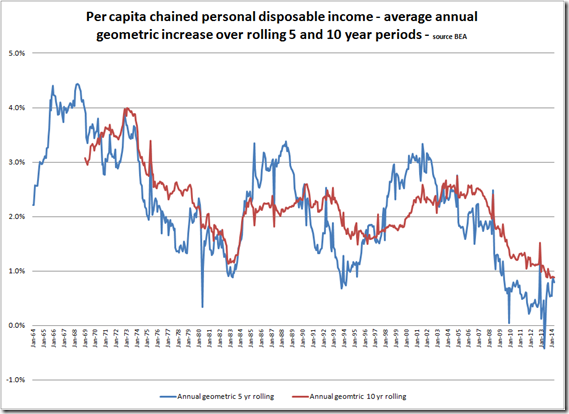 At least not since the 1960s..
Census Bureau–incomes are not enough! 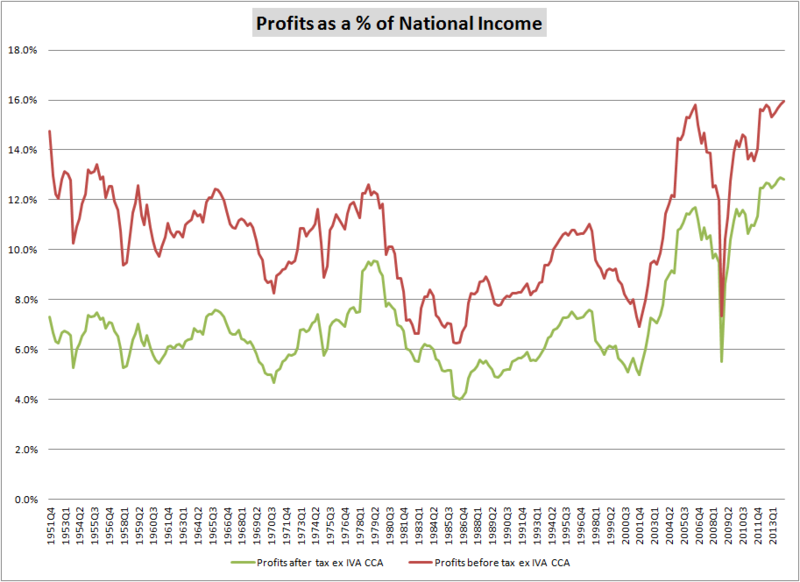 While more of what there is may be flowing to the top 1%, there is altogether less of everything.